This photo shows two features to look at when looking at the white birds in Florida and trying to identify them. 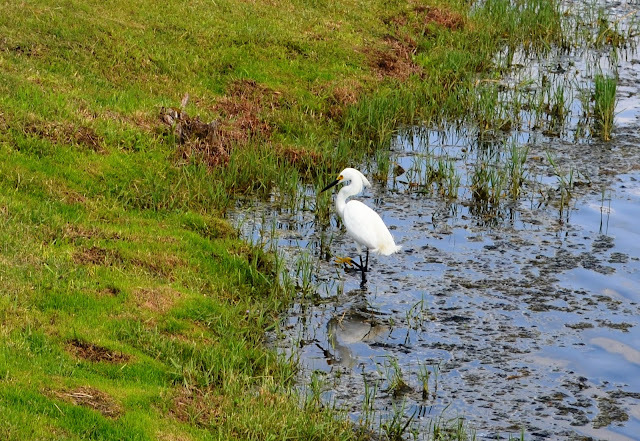 A Snowy Egret has a yellow rim around the eye, and his foot is yellow. Other birds that may be similar to the Snowy Egret include the Cattle Egret (often has yellow on the head), Great Egret (much taller, black bill, black legs (no yellow)), little blue heron (white phase note the blueish bill), white phase Great Blue Heron (much taller, grayer bill and legs). This photo was taken at the Providence Golf Club, in Florida.